Imagine the beach: sandcastles, ocean breeze, maybe a little skinny dipping if no one’s around? Now for a soap that captures all that! 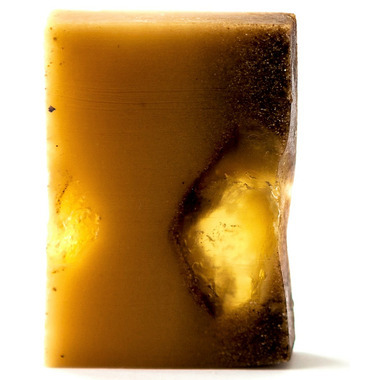 Packed with waves of exfoliating sand, stimulating litsea cubeba and detoxifying coriander to cleanse your hide. Spring Cleaning: Sweet lemony smelling litsea cubeba oil is extracted from the small pepper-like fruits of the Chinese Chang tree through steam distillation. It is known for its antiseptic properties. You Scurvy Dogs: The Lemon tree was originally a small thorny evergreen tree native to India. The fruit was well known in Europe by the middle ages, and Greeks and Romans were advocates of its therapeutic properties both as a skin cleanser and for cooling down itchy, irritated skin. Lemon essential oil reached the height of its fame when the British began using the citrus fruit to counteract the effects of scurvy. Favourite go-to soap! Smells delicious and itâ€™s super invigorating in the morning!